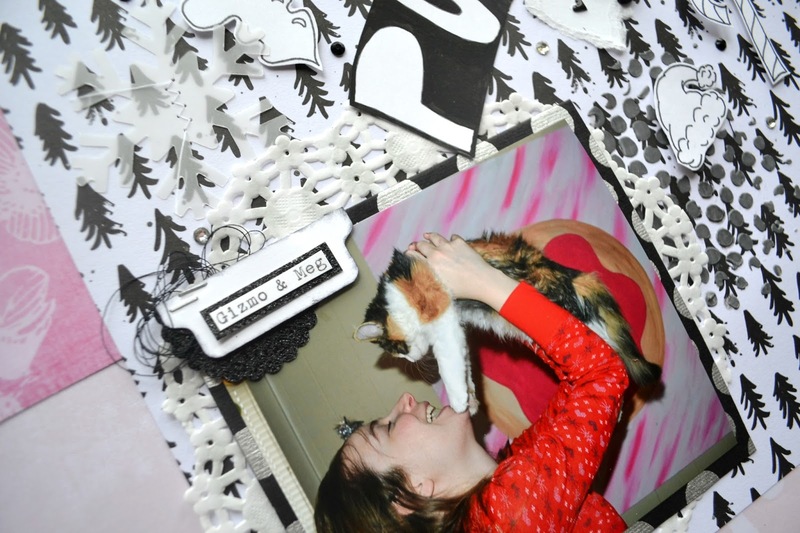 I*m just now scrapping my December photographs. Originally I had planned to make a December Daily, a page for each day of the month, after the holidays when I had more time. After evaluating my journaling and photos I had a little problem. For the most part I was good about keeping a journal entry everyday, BUT most of my photos were of my kitten or I just forgot to take pictures. oops..
My new approach, revert back to traditional scrapbooking (12x12) and focus on stories that are important to me in no particular order. I*m also going to mix in project life sleeves for tidbits like Q&A and lists. I absolutely love this layout. Last night I worked on a few Christmas cat layouts (lol) and I came across this paper from the paper pad "Joyful" by Mambi. It screamed fun and playful. I knew I wanted to use Christmas doodles for embellishments but I wasn*t positive about the color. Use pops of red or keep it purely monochrome. As you can tell I chose the latter. I wanted my photo to jump off the page then have your eye gradually discover the fun elements on the page. First I sketched my doodles and title in pencil. Then I outlined them with a black sharpie pen. For my title I intentionally made the letters gradually increase in size to fill the dead space toward the upper right half of the layout. I also decided against cutting out each individual letter because I was afraid they would get lost in the busy background, so I opted to paint the background with black apple barrel acrylic paint. When using paint, don*t forget to clean your brush occasionally while you are painting to prevent paint buildup in the bristles. Just dip it in water and wipe it on a paper towel to remove excess water. For the background I just had fun with it. First I roughly placed my embellishments on my layout so I would have an idea where everything would go. To me, I liked when my embellishments were clustered close to the purrfect. Then I removed all my embellishments so I could add some mixed media. If you loved your embellishment placement but you have to remove them for some reason, take a photo of the layout so you have something to reference. Yay, mix media!!! I mixed modeling paste with a little bit of black to create grey. My go to stencil was by Tim Holtz called Bubble (circles) and I just applied the paste with a palette knife like applying butter to toast. Remember, a little goes a long way. Then I splattered "Black Velvet" Color Shine all over my layout except for the top left and bottom right corners. 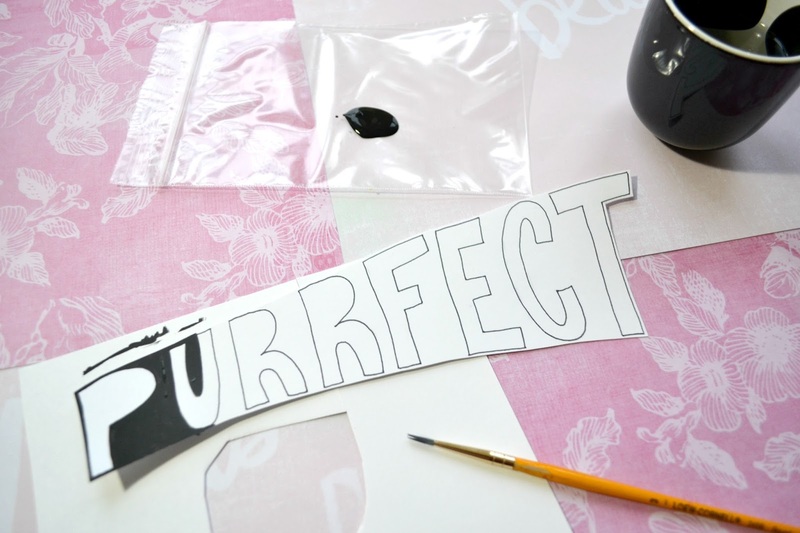 To prevent splatters in those areas I just laid scrap paper down as a mask. After everything dried, I started setting up my page again with all the embellishments. For a fun effect, I popped the small doodles up on mounting tape. The snowflakes are punched out of vellum and sewn on with a zig zag stitch. I also adhered little rhinestones in black and clear by The Paper Studio for more of a whimsical feel. To stay with the black and white scheme I needed to back the word "gift" because it got lost in the background. This was probably the hardest thing for me on the entire layout. Nothing looked quite right. I tried a rectangle, doily, punches, etc. Then I ripped some white paper and I really liked the texture of the fibers without being too demanding on the page. On the back of the layout I wrote my story about the photo with the month and year. Ohhh... before I forget, be on the lookout for my FREE Valentine printable. It should be available soon. Yay!! !